It was my sister, Teresa’s birthday yesterday. Just a week ago, her cute Boston Terrier, Gus died. So it was a bittersweet party. Gus was a party animal…literally. But every birthday is a reason to celebrate, right? 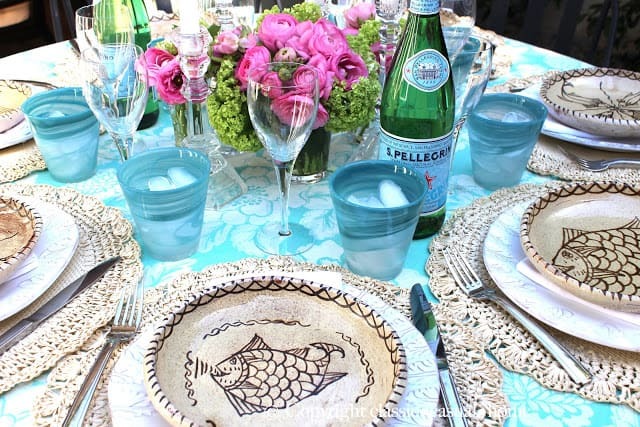 The table cloth is from Anthropologie. Have you seen these before? So cool! to eat the harmful aphids. 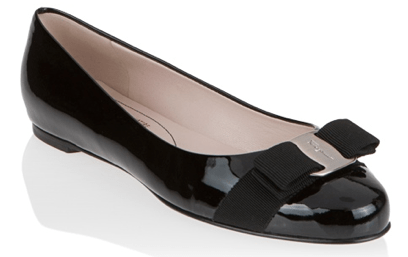 Inside the box were these timeless, Ferragamo flats. were fast at work protecting my roses. More fun ideas for a Turquoise Party are here. Unforgettable Tropical Boho Chic Party! Gorgeous! What a beautiful table you set. The colors, the flowers, and the happy guests. I think that says it all. Happy Birthday to your sister, MaryAnn! What a gorgeous table and present!!! Isn't it fun to fuss over the one's we love? She must have felt like a queen! Thanks for the summery inspiration! Lovely table setting for this special celebration, thanks for sharing! Mary Ann, can you please plan my next birthday dinner? 🙂 What a gorgeous table….and the Ferragamos aren't bad either! A HUGE THANK YOU to you for including me in your blog roll also. I'm honored! What a wonderful celebration, your sister must have enjoyed it very much! Everything looks beautiful. It sounds like your husband is quite an accomplished cook! 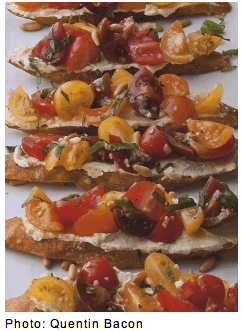 I have to try the crostini! Looks like a beautiful party. I love those plates! What a wonderful way to celebrate a birthday – the table, the food and best of all, the company! 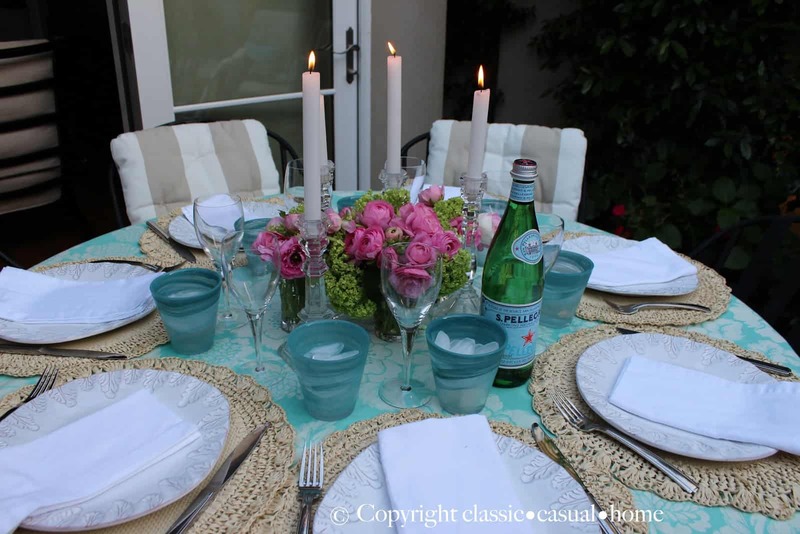 Your patio is just beautiful and the tablescape.. well, as they say "no body does it better"!! SOOOO gorgeous!!!! What a perfect setting for a celebration, just beautiful!! Love the flats, WANT!!!! Parabéns a sua irmã, uma linda festa você promoveu. Que mesa chiquérrima. Tudo muito lindo. Such a charming get-together for your sister, how sweet of you to make her birthday celebration such a special occasion! You keep that husband, my husband opens up a tin of peanuts as an app;) Will look for the lady bugs, great idea!! Wow — what a lovely party for your sister! 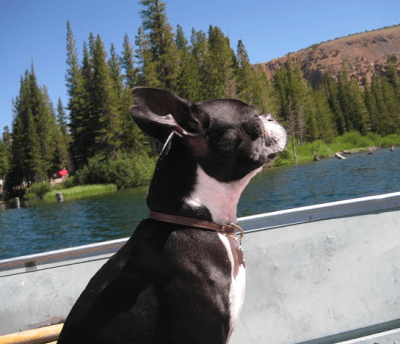 So sorry about the loss of her sweet Boston Terrier — they are such special dogs. We have a Boston Terrier, but he is a stinker. Great with us, but bad with the neighbors. : – ) Your sister must have enjoyed the celebration! I can say just one thong Wowwww! and Hapy Birthday, great party. I need a litle help to choise a web hosting for my page, , a friend of mine recommended me http://www.elcoplanet.com have you ever heard about them. i have checked there web site and it seems that they offer chip prices and good performances unlimited web hosting space and unlimited bandwidth. 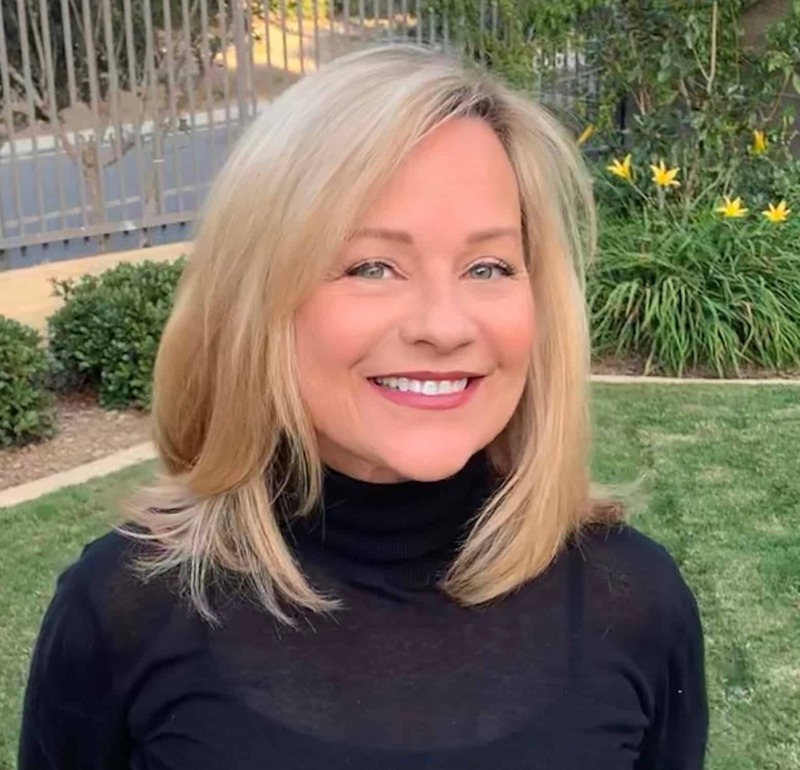 Hi Mary Ann, Awww….first Rocky and now Gus, I'm so sorry! But such a beautiful birthday celebration had to have brightened your sisters spirits! 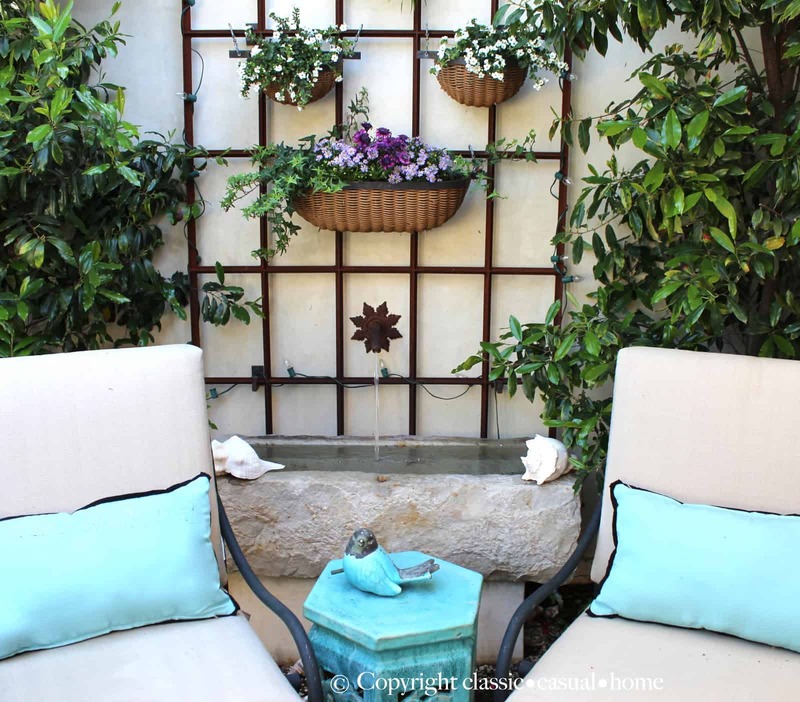 Turquoise is such a cheerful color and I love how you incorporated it though out your darling patio with pillows and other touches. 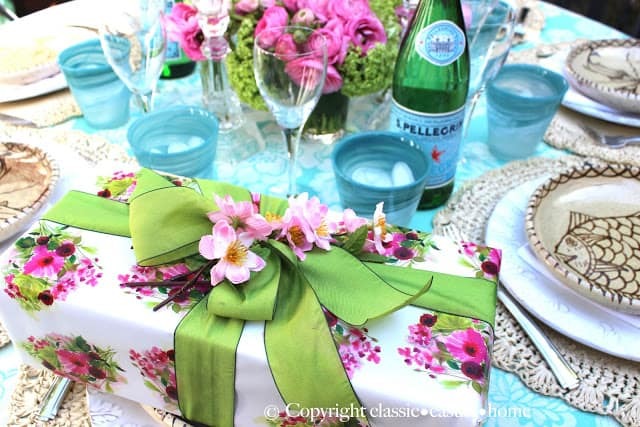 Your table…..was divine and the beautifully wrapped gift of those classic Ferregamo flats….just heavenly!!! I was at our Armstrongs on Sat. and saw the workers in their cute ladybug t-shirts…but they didn't give me any to bring home! I would need an army of ladybugs to help with my aphid problem! Tell your husband he's a keeper! Those appetizers he made looked delicious! What a beautiful setting , everything about it ! 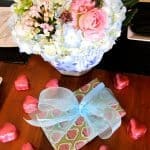 Thankyou for the inspiration , now how do I hint to my husband not only at the least how wonderful it would be to receive a wrapped gift but taking it to the next level makes the anticipation on whats inside all the more exciting ! 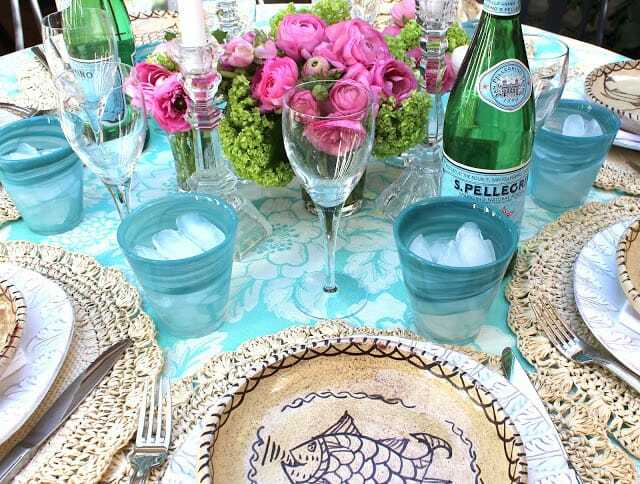 Such a pretty tablescape and your flowers over the trough looks like it provides such a serene setting. What a lovely birthday setting! She was so lucky to have all of you to cheer her up after her loss. This was a beautiful party, and so well coordinated. 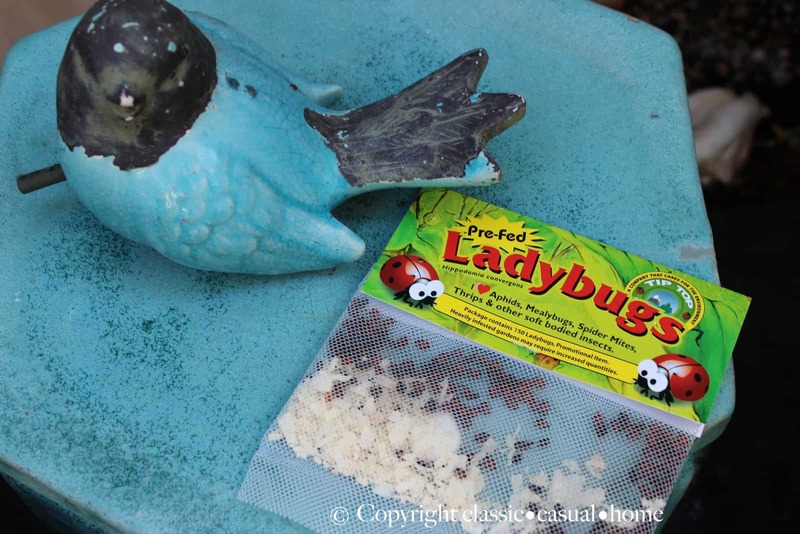 I have seen those ladybugs, but have never bought them. 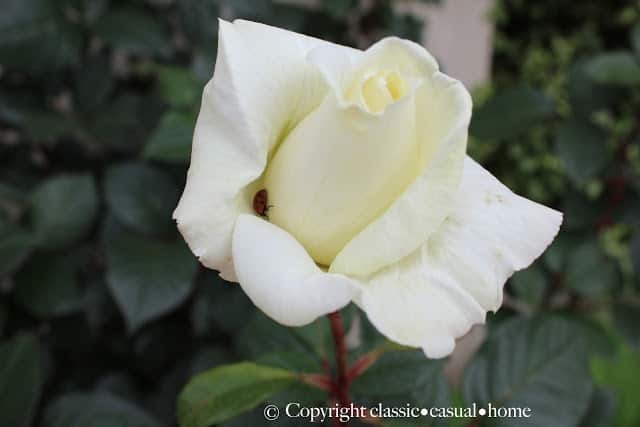 Mary Ann…so hard when we loose a pet…so glad your sister has you to cheer her up……It was a beautiful party…..I love all the torquoise! 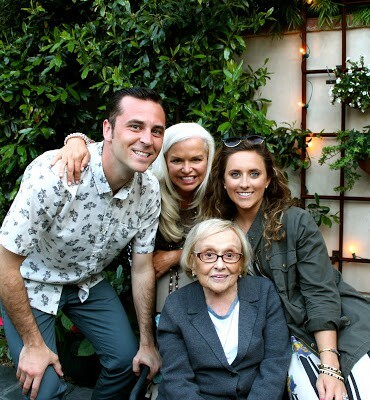 Such a lovely birthday party Mary Ann! Everything is so fresh and the food looks delicious. Sorry to hear about the loss of the pup. We have two dogs and one is 13 .. she is nearing the end of her time with us and it's always sad to imagine her not with us. Enjoy your day .. and those flats are darling:) I'm sure she loved them! 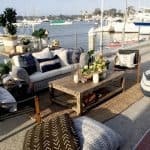 So pretty…love the colors and the beachy elegant vibe. You are a master at party planning. Just love it! Happy birthday to your sister! What a perfect party you threw for your beautiful sister! You are the hostess with the mostest Maryann!!! Happy birthday to your beautiful sister! The party looks spectacular with all the right touches..you really know how to throw a party and make someone feel special! Oh, and I love her present…you know how I like flats! 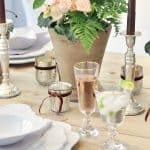 Your tablescape is so beautiful! I love the colors. I feel so bad about gus. That is such a hard thing to go through. The pink and turquoise is so pretty and feels so happy. absolutely gorgeous Mary Ann! I love the turquoise and hot pink combo-looks like you all have a fabulous evening! Sorry about Gus. I have a client with a Boston Terrier and I live for meetings at her house so I can visit the dog. What a gorgeous party! Your sister is one lucky gal…I'm sure you made her birthday 🙂 So sad about the pup…He was such a cutie! Awwww so sorry about your sisters puppy….it just kills you. Gorgeous table and I know she appreciated the wonderful celebration!